Atlanta United striker Josef Martinez has been named the MLS' Most Valuable Player. The 25-year-old Venezuela international saw off competition on the shortlist from his team-mate Miguel Almiron (runner-up), LA Galaxy forward Zlatan Ibrahimovic (third), DC United's Wayne Rooney (fourth) and Los Angeles FC's Carlos Vela (fifth). His side will be looking to win their maiden MLS Cup title when they take on Portland Timbers at the Mercedes-Benz Stadium in the early hours of Sunday morning, live on Sky Sports. 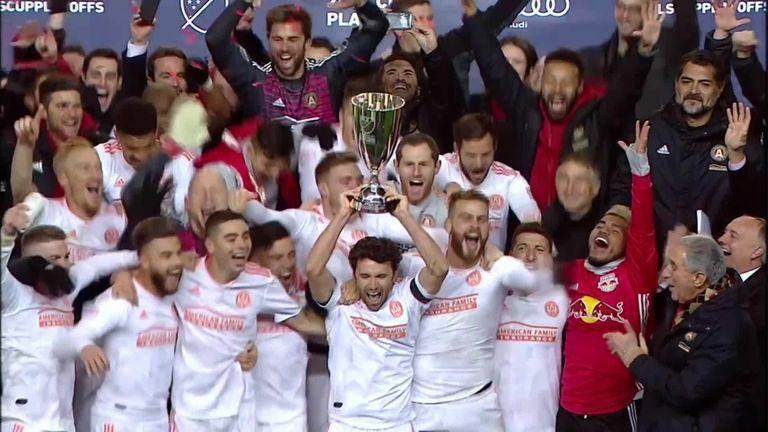 Atlanta United will look to win their maiden MLS Cup title when they take on Portland Timbers at the Mercedes-Benz Stadium on Sunday. Martinez, who joined Atlanta from Torino in 2017, received his Landon Donovan trophy during a ceremony on Wednesday at the headquarters of United owner Arthur Blank. "I'm very happy because this is an award we all wanted," Martinez said. "It is due to a lot of work by myself, my team-mates, my coaching staff and my family. I just want to thank all those people." He credits his team-mates for giving him plenty of scoring chances, and has his sights set on another trophy in Sunday's final. "We want to be champions. We've been working two seasons for this opportunity. We don't want to let it slip away."